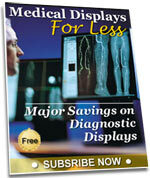 Receive special pricing from the top medical display companies along with white papers and software updates: Learn More. Discontinued Product. 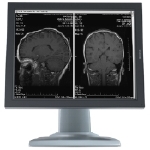 This product has been replaced with a DICOM calibratable model, the TOTOKU CCL208. LOW QUANTITY AVAILABLE. MANUFACTURING DISCONTINUED OF THIS DISPLAY. 2MP Totoku Color LCD w/ DICOM Cal. Discontinued Model - See next page for link. Premium 3MP Grayscale Diagnostic Display. Premium 3MP Diagnostic Color Display. Discontinued Product. Please see the navigational bar to the left for the latest Totoku 5MP products. Replaced with ME20CR, see link above. Thie product has been replaced by MDMG-5121. Call for the Best Price! Superb Visual Quality. DICOM Calibration. Discontinued Product. See next page for link. High luminance model best suited for color medical images whose increased use is expected. 3MP Barco Nio Color Display OPEN BOX SALE! 3MP Barco Nio Grayscale Display OPEN BOX SALE! DISCONTINUED MODEL. Please see the navigation bar to the left for current EIZO products. 6MP BARCO Wide-screen Diagnostic Medical Color Monitor with 5200 card. HOT! Discontinued Product. Please see the navigation bar to the left for current Barco display solutions. This Product is discontinued. Please click on the detail button and follow the new link. Disconituned Product. Please see the navigation bar to the left for current NDS Dome display solutions. This product has been replaced. Click on More Detail for link to new product. DISCONTINUED MODEL Click here for current 5MP dual head systems. DISCONTINUED MODEL. Please see the navigation bar to the left for current DOME products. EIZO Quality Control supports Macintosh Computers! NDSsi LCD II Photometer (Chroma 5). Dome S10 - The Premium 10MP Diagnostic Grayscale Display. Discontinued Product. Please see the navigation bar to the left for the latest EIZO 5MP displays.